The finance director for Elizabeth Warren's 2020 presidential campaign resigned after an internal clash over the candidate’s decision last month not to host big-money fundraisers or solicit donations from wealthy donors, the New York Times reports. The big picture: Though it's unclear when exactly finance director Michael Pratt resigned, news of his departure comes just ahead of Sunday's first-quarter fundraising deadline. 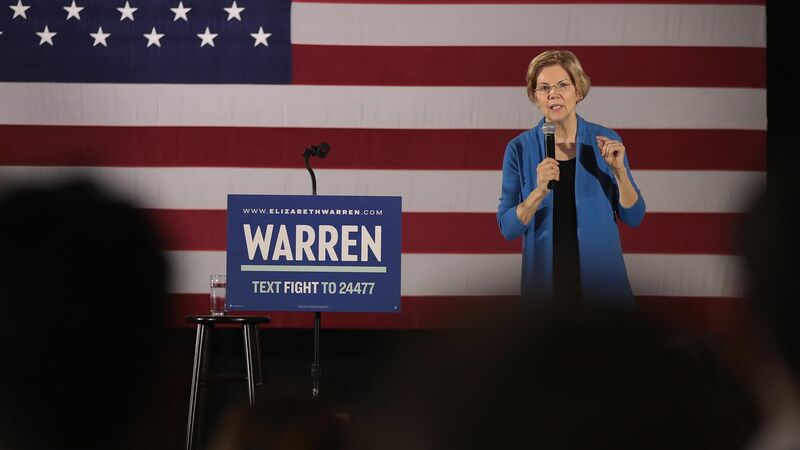 The Times reports that Warren is lagging behind her competitors and has struggled to raise campaign dollars, even as she leads the Democratic field in putting forth bold new policy proposals. Warren has reportedly transferred $10 million from her Senate campaign account. Details: Pratt resigned after a Valentine's Day meeting in Washington that "grew heated," in which he argued that cutting off the “significant cash stream” would put the campaign at risk of collapsing, per the Times. "He pointed out that winning over wealthy fund-raisers across the country helped build networks that could translate into political support, not just checks. But Mr. Pratt lost the argument to two of Ms. Warren’s closest advisers, Dan Geldon and Joe Rospars, who made the case about standing apart from the field and freeing up her schedule," the Times reports.